If Hilliary Clinton had picked a successor whose sole purpose was to make her tenure as Secretary of State look absolutely brilliant, it would be John Kerry. Hilliary’s term was marked by no particular accomplishments, and if it weren’t for Benghazi she could of claimed no particular problems either. She cruised through her years as America’s top diplomat in the most risk adverse manner. Seemingly, hoping to avoid anything that might mar her carefully polished image. The problem for Hilliary, her adventures in mediocrity do not make a compelling enough argument for propelling her to the White House. The only way for her to look brilliant was to be followed by an absolute buffoon. As luck would have it, President Obama found the perfect person to fill that role. There has not been a more inept Secretary of State in modern history, nor a more embarrassing one. Watching Kerry in action, one can only wonder how he ever came so close to becoming President? Trying to sound like a man of the people, he converses to subordinates in an condescending hokey vernacular; one that sounds more like someone from the back woods then a denizen of Beacon Hill (among others). Given his recent actions, his unsophisticated persona might be the true one. What kind of person would think trying to hug the President of France and having James Taylor sing You Got a Friend is a good way to smooth over a diplomatic debacle? Even a construction worker would have had more common sense than that. The scene, as it unfolded, would of been hilarious, if it hadn’t been so pathetic. A person who should be happy to have Kerry around is Vice President Biden. He now has a fellow administration flunky that makes worse gaffes than him. 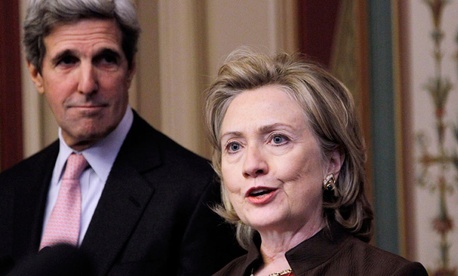 Of course, President Obama did not appoint Kerry to make Hilliary look good. He certainly did not appoint him for his verbal skills either. Kerry, Biden, and all of Obama’s recent picks to fill top positions, seemed tn be merely there to fill space. Men and women whose dearth of common sense is their most prominent feature. Perfect patsies for a man who wants all to bend to his will, and conform to his worldview. If President Obama has a foreign policy, it could be described as strategic disengagement. The art of not leading or getting involved except in a very few hand picked circumstances. In essence, keeping a presence on the world stage, but not a significant one. The fact he missed the march in Paris was apropos, as he is missing most of the time. On the other hand, there might be no strategy at all, it could just be the sad reflection of his disconnection from reality. There is plenty of evidence for this as well. His steadfast refusal to address the threat posed by Islamist is a prime example. Calling the terrorist nihilist, or people without beliefs, he exemplifies a person living in a world of his own making. Kerry, channeling his boss, described Islamic terrorism as criminal conduct rooted in alienation, poverty, thrill-seeking. Apparently, both the President and John Kerry have failed to read anything put out by Al Qaeda, ISIS, Boko Haram or any other terrorist group, looked at their videos or listened to the radical Imams egging them on. No one, not even moderate Muslims, claim that Muslim terrorism is totally disconnected from Islam. No one, that is, except Obama and his cadre of fools. Barack Obama’s denial of reality does not end with whether Islamist kill for Allah or not. He thought Putin was someone he could work with, called ISIS a JV team, Al Qaeda in Yemen all but eliminated, took credit for falling oil prices, and thinks caving to Iran and removing sanctions will stop their nuclear ambitions. He stated, in all seriousness, that the U.S. is less racially divided under his presidency. This is a man who entered the White House vowing to restore America’s credibility in the world, and apparently thinks he has. The truth is, President Obama has no friends among the leaders of the world, a remarkable achievement that sets him apart from his predecessors. Of course it is of little wonder, this is the same person who decided not to attend the funeral of Margaret Thatcher and refused to take part in the march against terror, yet he canceled everything to run to Saudi Arabia and pay his respects to the late King Abdullah. The last item was an appropriate response, but given his history a curious one. Whether all of this is part of some misplaced idealism, done purposely with some end goal in mind, or just the reflections of a deluded mind is unknown. He has a record of lying to advance agendas; on the other hand his and his spokesmen’s statements have strayed so far from reality it is hard to imagine there being some master plan. As for the Washington Post, it has decided which side of the debate it is on. Citing several sources, it claims it is now unanimous, Obama’s foreign policy is delusional.